Above: Israel given the "green light" by Trump/Bannon. 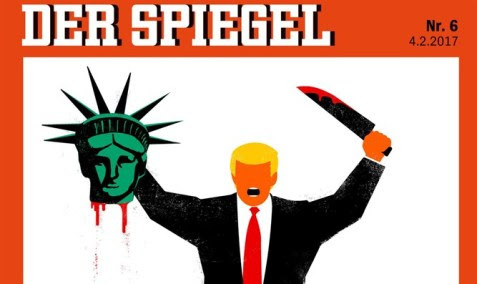 Germany looks at Trump's behavior, Der Spiegel. I want to begin by calling for a commemoration. Every 9/11 we commemorate the victims of that terrorist attack. Yet we have no day of commemoration for the victims of the Bowling Green Massacre. Fake news media, such as the New York Times, CNN, MSNBC, ABC, CBS, and so on claimed it never happened, but try telling that to the victims. Are we to ignore it simply because it did not happen in Kentucky? Fox has reluctantly been added to the list as of 2 hours ago. We also have to explain Putin. Fake news has show photos and clips of children affected by strikes in Ukraine, that received the loan of Chechnya from Nikita Khrushchev, but those photos never identify the direction from which the missiles hit. Are they taken from the South or the North? They seem to indicate that they are taken from the south, and that makes for better lighting, and in that case the attacks came from the west, Kiev, not from the West. Until that is resolved, we cannot really tell. Putin has demanded an apology from Fox news for calling him a "killer," but they are unlikely to do so. Remember, you heard it hear! Finally, Teresa May of Britain seems to have been the last international leader to talk to Donald while he was still somewhat sane. Since then, his behavior has become such as the people of that country have petitioned Parliament to have him disinvited for his official visit, one reason given as it would be an embarrassment to the Queen. As best I remember, about 200,000 signatures are needed to force a debate in Parliament (not sure at all on that), but that petition is approaching two million signatures. The Speaker of Parliament has announced that if he comes, he will not be allowed to speak in Parliament. Some others have suggested that he be allowed to visit, but stopped at the airport and, I might add, be handcuffed for 5 hours just as a five year old was handcuffed in the U.S. as a result of Trump's "Executive Order". A temporary restraining order will be debated on the West Coast (a place Bernard Levy, author of "The Wisdom of the Jews" or something like that has called anti-Semitic). Supposedly, that argument will be on live stream at 2400 GMT from some court's feed, but this is "fluid" as people enjoy saying. Asked for comment, Trump said "Courts Bad". We turn now to look at President Trump's emerging foreign policy. Last week, Trump reportedly abruptly ended a call with Australian Prime Minister Malcolm Turnbull after complaining about the terms of a refugee deal between the U.S. and Australia. Meanwhile, during a call with Mexican President Enrique Peña Nieto, Trump reportedly threatened to send U.S. troops to Mexico. Trump's national security adviser, Michael Flynn, also announced the United States was putting Iran "on notice"—but it's not clear what that means. And Trump's first covert operation in Yemen went disastrously wrong: One U.S. Navy SEAL and as many as 23 Yemeni civilians died as a result. We speak to Harvard professor Stephen Walt. His recent piece in Foreign Policy is headlined "Trump Has Already Blown It." JUAN GONZÁLEZ: We turn now to look at President Trump's emerging foreign policy. Last week, Trump reportedly abruptly ended a call with Australian Prime Minister Malcolm Turnbull after complaining about the terms of a refugee deal between the U.S. and Australia. Meanwhile, during a call with Mexican President Enrique Peña Nieto, Trump reportedly threatened to send U.S. troops to Mexico. Speaking last week, the president urged Americans not to worry. PRESIDENT DONALD TRUMP: When you hear about the tough phone calls I'm having, don't worry about it. Just don't worry about it. They're tough. We have to be tough. It's time we're going to be a little tough, folks. We're taken advantage of by every nation in the world, virtually. It's not going to happen anymore. It's not going to happen anymore. JUAN GONZÁLEZ: In another foreign policy development, the Middle East, Trump's national security adviser, Michael Flynn, announced the United States was putting Iran "on notice"—but it's not clear what that means. Meanwhile, Trump's first covert operation in Yemen went disastrously wrong: One U.S. Navy SEAL and as many as 23 Yemeni civilians died as a result. Leaders in Europe are openly expressing concern about Trump's actions, including his apparent close ties to Russia. Last week, the president of the European Council warned Trump was a potential threat to the European Union. AMY GOODMAN: And Trump is facing opposition even in Britain. On Monday, the speaker of the commons said he would refuse to invite Trump to address the British Parliament during Trump's upcoming state visit, citing Trump's racism and sexism. To talk more about Trump's foreign policy, we're joined by Stephen Walt, international relations professor at Harvard University. His recent piece in Foreign Policy is headlined "Trump Has Already Blown It." How, Professor Walt? How has he blown it? STEPHEN WALT: Well, I think you could argue that Trump had an opportunity, when he was elected, to move American foreign policy in a somewhat different direction—and there would actually have been substantial public support for that—away from military interventionism, trying to get a more even distribution of labor with some of our key allies, working for economic arrangements that benefited Main Street as much as they benefited Wall Street. So he could have done that. Of course, he's done the exact opposite. He has been picking fights with some of our traditional allies, and doing that to no good purpose, with no real end in mind. He's inexplicably continued to defend the bad behavior of Vladimir Putin. And he's got a completely contradictory approach to the Middle East that isn't likely to accomplish any of the objectives we might have there. Now, that's a lot to do in two weeks, and it's possible, of course, that there will be some quick corrections, and they'll get us back on an even keel. But so far, this does not appear to be a foreign policy that's very promising, even for people who might have supported him. JUAN GONZÁLEZ: And, Professor Walt, in this clip we just played, his emphasis on being able to talk tough and this notion that the rest of the world is taking advantage of the United States, how has that played in the rest of the world? STEPHEN WALT: As you might expect, very badly. I mean, these initial phone calls are sort of "get acquainted" opportunities with some key world leaders. And for Trump to pick a fight, essentially, and to treat the prime minister of Australia—remember, this is one of our closest allies in Asia. This is a country whose soldiers fought with ours in World War II, in Korea, in Vietnam, in Iraq and in Afghanistan, and, in fact, still have soldiers in Iraq today. This is one of our closest allies. And to treat the prime minister there, in their initial phone call, with a certain degree of contempt played very badly in Australia, as you might expect. AMY GOODMAN: One of the first—I want to turn to Fox host Bill O'Reilly's Super Bowl interview with President Trump. BILL O'REILLY: You talked to Putin last week. You had a busy week last week. PRESIDENT DONALD TRUMP: A busy week, yeah. Busy week and a half. BILL O'REILLY: Do you respect Putin? BILL O'REILLY: Do you? Why? PRESIDENT DONALD TRUMP: —major fight, that's a good thing. Will I get along with him? I have no idea. It's very possible I won't. BILL O'REILLY: He's a killer, though. Putin is a killer. PRESIDENT DONALD TRUMP: A lot of killers. We've got a lot of killers. What? You think our country is so innocent? You think our country is so innocent? BILL O'REILLY: I don't know of any government leaders that are killers in America. PRESIDENT DONALD TRUMP: Well, take a look at what we've done, too. We've made a lot of mistakes. I've been against the war in Iraq from the beginning. PRESIDENT DONALD TRUMP: —a lot of killers around, believe me. AMY GOODMAN: "We've got a lot of killers. You think our country is so innocent?" Professor Stephen Walt, your response? STEPHEN WALT: Well, first of all, Trump is, in fact, correct that the United States has made a lot of mistakes in its foreign policy, and some of those mistakes have had real human consequences. So that's correct. The problem here is that, first of all, he's equating Russian behavior with our behavior, and I think there are some clear differences. But more importantly, he's using our mistakes to excuse what Russia may be doing today. My mom used to tell me that two wrongs don't make a right. And for him to essentially say, "Well, it's OK what Russia is doing. It's OK to prosecute, persecute, possibly murder journalists. It's OK to destabilize other countries. It's OK to invade the sovereign territory of other countries, etc., because, after all, we've done similar things," is not, it seems to me, a constructive way to approach our relationship with Russia. And it's certainly not a way to try and improve our relations with other countries. If we've made mistakes in the past, then what we should be doing is learning from them and not repeating them, as opposed to using them as a way to excuse the behavior of countries that, you know, we have to deal with. And we have to establish a reasonably constructive relationship, but one that's also based on mutual respect. JUAN GONZÁLEZ: Well, Professor Walt, I wanted to ask you about the situation with Mexico, because, as you mentioned, Trump did say often during the debates and in his campaign that he was against nation building, against so many foreign adventures, but yet, in one of his first phone calls with the president of Mexico, he warns that if Mexico doesn't handle its situation, its crime situation, he may have to send in troops to do it for them. STEPHEN WALT: Yeah, I have—you know, they later claimed—the White House claimed that this was merely a joke. But again, this is not the kind of joke, it seems to me, you want to make with a leader you don't know particularly well and where the long historic relationship with Mexico has been troubled occasionally by American military intervention. It shows a certain ignorance. It shows a real insensitivity. And I think it also gets back to this really quite absurd situation that Trump got himself into by claiming he was going to build this wall and he was somehow going to get Mexico to pay for it. This was a great applause line on the campaign trail, but it makes absolutely no sense as a foreign policy position. Mexico doesn't want the wall. Mexico has no interest in the wall. And the idea that you're going to get another country to pay for something it doesn't want and has no interest in having just suggests that you don't understand how foreign policy works. And I'm afraid that's what we're dealing with with our current president. 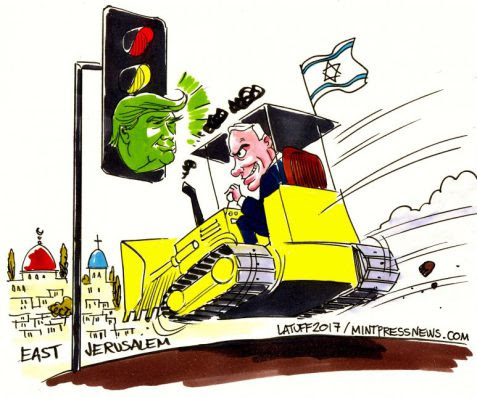 AMY GOODMAN: On the question of Israeli settlements, last Thursday, the White House said, quote, "While we don't believe the existence of settlements is an impediment to peace, the construction of new settlements or the expansion of existing settlements beyond their current borders may not be helpful in achieving that goal." This might have surprised many, considering President Trump's choice of the Israeli—U.S. ambassador to Israel, David Friedman, his bankruptcy lawyer, who actually heads up a fundraising effort for one of the settlements, has raised millions of dollars. Your response? STEPHEN WALT: Well, first of all, I think the statement itself is just a lot of double-talk. Everyone understands that the settlement project is an impediment to peace. It's one of the most important reasons why it's hard to create a viable Palestinian state. And, of course, the fact that the settler movement in Israel is dead set against any possibility of a Palestinian state—a position, by the way, I think, also shared by the Netanyahu government—just reaffirms this. So, to argue that existing settlements aren't a problem, but new settlements might be a problem, just doesn't add up, doesn't make sense. I also think that what we see here is that the Trump administration hasn't really figured out what its position is on Israeli-Palestinian peace or even its relationship with Israel. Yes, they're going to be very supportive, probably more pro-Netanyahu than any other previous American president has been, but I don't actually believe they want to get involved in the peace process at all. A couple of times Trump has said that he was going to turn his son-in-law, Jared Kushner, over and put him this problem, and that he would solve it. Of course, this is someone with no foreign policy experience, no diplomatic experience, as well. I think the bottom line here is the Trump administration is likely to be very bad for the Palestinians, but also very bad for Israel itself, because, in effect, they're going to allow Israel to continue to create an apartheid state in greater Israel, and that is not in Israel's long-term interest. JUAN GONZÁLEZ: And, Professor Walt, I'd like to ask you about the growing tensions with Iran. Obviously, the ban on the seven Muslim nations, the one that's most affected, Iran, with some 12,000 foreign students here in the United States, but also now National Security Adviser Flynn putting Iran "on notice" in terms of its missile testing. What does "on notice" mean? STEPHEN WALT: Well, nobody knows what that means. Obviously, Iran knew we cared about their missile program. We have a contentious relationship with Iran. There are groups in the United States and in Iran who would like to try and improve the relationship, to try and build on the successful agreement to cap Iran's nuclear program. But there are also groups, both in Iran and here in the United States, who want to maintain a relationship that's highly conflictual, and maybe want to go beyond that. And it seems to me that the Trump administration is aligning itself with those groups, as well, wants a—to raise the temperature with Iran. I think this is playing with fire in a number of respects. One thing we know about Iran is they don't particularly respond well to American pressure. If we start threatening them militarily, if we start taking military action against them, that will give them an obvious incentive to try and restart their nuclear program. And that then places the United States in the position of whether or not it genuinely wants to go to war to try and prevent that. I think the Obama administration understood that that path was not the path we wanted to go down. I think we have to worry now, given the attitude of Mr. Trump and some of his closest advisers, that they actually see a conflict with Iran as being in the United States' interest. The big problem, of course, is they also seem to want to have a conflict with almost the entire Islamic world, while at the same time getting some of the members of the Arab or Islamic world to help us with ISIS. Again, this is just an example of where their policies are deeply contradictory and, therefore, are unlikely to succeed. On Monday, President Trump falsely claimed that the media is intentionally covering up terrorist attacks. "It's gotten to a point where it's not even being reported," Trump said. "And in many cases, the very, very dishonest press doesn't want to report it." The claims appear to be part of a wider push by the White House to increase fear about potential—and even imaginary—terrorist attacks in order to justify President Trump's crackdown on immigration, including his Muslim ban. We speak to Harvard professor Stephen Walt. His recent piece in Foreign Policy is headlined "Trump Has Already Blown It." AMY GOODMAN: Finally, you just tweeted, "New theory"—you just tweeted, "The media is NOT covering terrorism? Is #trump serious? Delusional? Incurably dishonest? All of the above?" Donald Trump falsely claiming Monday during a speech to U.S. CENTCOM in Florida at the MacDill Air Base that the media is intentionally covering up terrorist attacks. Your response? AMY GOODMAN: We're going to have to leave it there, Professor Stephen Walt.